Signed as a free agent on Oct. 3, 2018. Hartley was selected in the sixth round (54th overall) by the Ottawa RedBlacks in the 2017 CFL draft. He was released by the RedBlacks on Sept. 14, 2018. (Ottawa/Calgary) Hartley started the season in Ottawa and played five games including three starts. He had three catches for 22 yards. 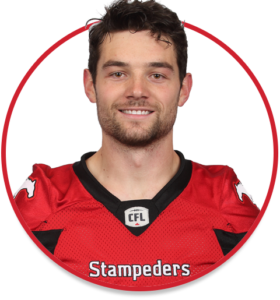 The first two regular-season receptions of his CFL career came in his hometown of Calgary in Week 3. Hartley was released by the RedBlacks on Sept. 4 and signed with the Stamps on Oct. 3. He spent the remainder of the season on Calgary’s practice roster. (Ottawa) Hartley dressed for 11 regular-season games – making his CFL debut on July 8 against Toronto – and did not record any stats. He also played in the Eastern Semi-Final and had two catches for 57 yards. Hartley played four seasons (2013-16) at the University of Calgary and had 85 career catches for 1,334 yards and eight touchdowns. He earned Canada West all-star honours in 2016 as he led the conference with an average of 110.2 receiving yards per game. In six regular-season games, Hartley made 45 catches for 661 yards and four touchdowns. Hartley competed in track, basketball and swimming at Calgary’s Bishop Grandin High School. He was the school’s athlete of the year on three occasions and was also on the honour roll.